Save even more! adns.us Call Alert is only $1.95 mo. if you already have or switch to our accelerated plan adns.us 6XL! Call Alert requires Call Waiting service from your phone company to work. Call Waiting Caller ID service (also known as Call Waiting ID of Visual Call Waiting or Call Waiting Deluxe) is needed to see caller's name and number when online. Please contact your phone company to activate these services. Call Alert also requires a V.92 modem connection. adns.us Call Alert lets you receive and screen phone calls while you are online. The program uses your V.92 modem and Call Waiting service from your phone company to detect incoming calls. If you have Caller ID on Call Waiting, also called Call Waiting ID or Visual Call Waiting, Online Call Alert will show the caller's name and number, so you can decide if you want to answer the call or ignore it. If your Internet Provider supports Modem-on-Hold you can put internet on hold, take a call and continue browsing after you finish talking. Unlike other Internet Call Waiting services, adns.us Call Alert does not transfer your calls anywhere. It uses your modem to get Caller ID information supplied by the phone company. So your privacy is protected and you are in complete control of your calls! 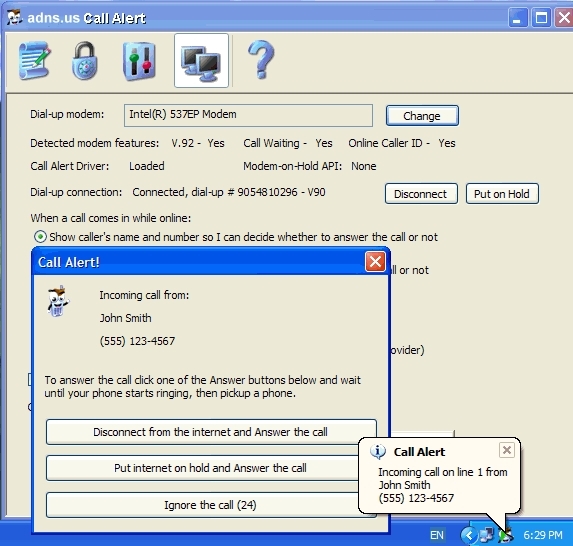 adns.us Call Alert uses your modem to identify callers before you answer the phone. You must subscribe to the Caller ID service from your phone company and have a Caller ID capable modem. adns.us Call Alert shows a balloon with the caller's name and number. The program also announces incoming calls using text-to-speech engine. You can set a different ring tone for each caller or type of callers. 20 ring tones are included with the program plus you can use any wav file. adns.us Call Alert logs all incoming calls received while you are online and offline. It keeps the date, time, name and phone number of each call. You can view a complete call history or calls received today, this week or this month. You can select what type of calls you want to see - all calls, local calls, long distance calls etc. Call history is stored in a standard CSV file and can be edited and exported to other programs using Microsoft Excel. Privacy Manager allows you to configure how adns.us Call Alert handles incoming calls. For example, you can set adns.us Call Alert to automatically answer all calls from private (blocked) numbers after the first ring and play a message telling the caller to unblock his/her number. adns.us Call Alert can block calls from specific numbers or reject any other type of unwanted calls (blocked number, out of area etc.) by answering and playing selected message. Several useful messages are included with adns.us Call Alert. You can also record your own wav files and use them with the program. If you don't want to be bothered by late calls you can set your "quiet time" and adns.us Call Alert will block all calls during that time. Important numbers can be marked so they ring through anytime. All Privacy Manager settings including names and numbers are stored in a standard CSV file and can be imported from or exported to other programs using Microsoft Excel. adns.us Call Alert can automatically 'zap' telemarketers with a special 'number disconnected' tone. After receiving this tone telemarketer's computer will delete your number from its database. The program can play Federal 'do-not-call' warning forcing telemarketers to remove you from their calling lists - by law! You can set the program to reject unwanted calls manually or automatically after selected number of rings. If you select to zap the calls manually the program pop-ups a dialog and lets you decide if you want to zap this call or not.